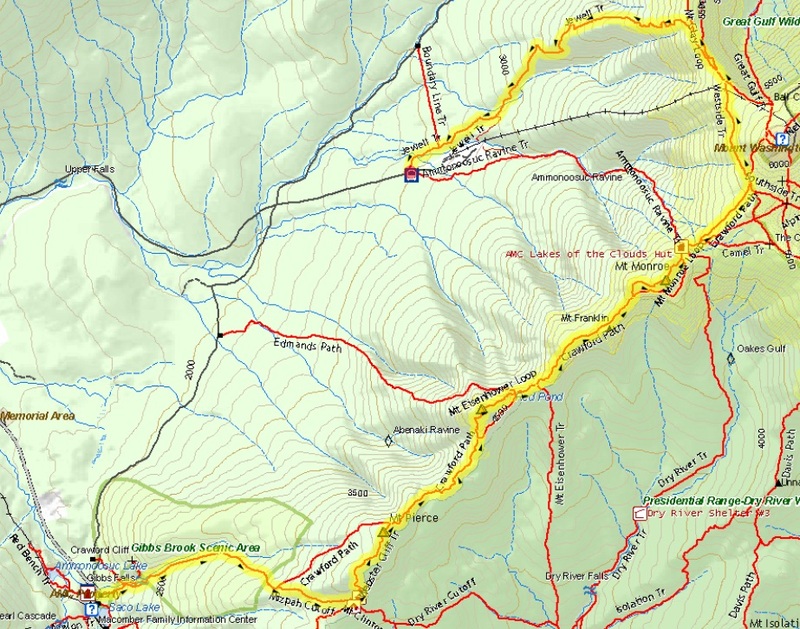 There’s no better time to head for the hills (literally) than in the midst of a heat wave, and that’s just what we did on July 17th as temps were hitting 90 degrees in Crawford Notch. Gaining elevation with each step, we headed for the cooler air at Mizpah Spring Hut, perched at 3,777 feet. We made (kinda) quick work of the 1.5 miles from the Highland Center to the Mizpah Cutoff, scrambling over rocks and roots along this forested section of the historic Crawford Path and dunking our hats in the small gurgling streams that crossed our path from time to time. With the 6:00 dinner “gong” at Mizpah quickly approaching, we pushed on along the final .7 miles to Mizpah. Checked in and bunks picked out, we sat down with some friendly folks, including a family from Toronto and a couple of counselors hiking with a Maine girls camp. Dinner was delicious too with a tasty soup, salad, pork loin, and the staple of AMC Huts, freshly baked bread. That night’s surprise dessert turned out to be…cheesecake brownies!!! Storm clouds began to build towards the end of dinner and, as darkness set in, thunderclaps and flashes of lightening moved closer. We peered out of the windows at the impending storm, marveling at our backcountry vantage point and enjoying the heavy pitter-patter as rain began to come down in sheets. Heavy fog greeted us at breakfast the next morning, but by the time our packs were loaded up around 8:30, the fog had lifted and warm sunshine filtered through. Tipping our cap to Mother Nature for the fortuitous weather, we hit the trail from Mizpah and set a course for Lakes of the Clouds Hut via the Crawford Path and the summits of Pierce, Eisenhower, Franklin, and Monroe. Hiking along the ridge, there was a nice breeze and temperatures were very pleasant – clouds rushed overhead and the occasional low-lying cloud rose up from the valley below and slipped silently past – making for an exceptional day to be in the alpine zone! The final scamper up Monroe was looming and Lakes of the Clouds was just on the other side. We had made steady progress, and the thought of a well-deserved break atop Monroe gave us a jolt of energy as we bouldered up the last pitch. The dinner at Lakes of the Clouds was phenomenal, thanks to the efforts of the volunteer fill-in croo. Our favorite? The “Sub-alpine Corn Chowda” paired with “Monroe Flats Honey Oat Bread.” Mmm-mmm! Bellies full, we could hear the peepers chirping away up at the lakes so, naturally, we needed to investigate further. As the sun set behind the increasing cloud bank to the west, we couldn’t help but reflect on the day’s hike and the intense beauty and serenity surrounding the hut. The next day, we hiked out taking the Westside Trail to the Jewell Trail, and then caught the AMC Hiker Shuttle back to the Highland Center. Using the handy-dandy White Mountain Guide Online to tally our mileage and elevation, we figured out our 3-day hike was around 13.4 miles with an elevation gain of 5,405 feet and a loss of 4,863 feet. We also bagged 4 peaks! Catch you on the trails! Josh L. and Laura H.